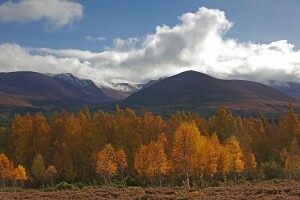 The Aviemore and Vicinity Community Council extends from the Monadhliath Mountains in the west through the ancient Caledonian pine forest of Rothiemurchus to Glenmore and Cairngorm in the east. The bulk of the population is in Aviemore which has grown from a small railway junction to an internationally recognised ski resort which now also offers an increasingly large number and variety of indoor and outdoor sports and activities. With this diverse range of winter and summer activities, together with a year round programme of festivals and events, the area is open for 52 weeks of the year. There is a strong record of conservation in terms of the care for the countryside and indeed conservation is important in many of the businesses. There are two National Nature Reserves and much of the rest of the area has environmental designations. The general purpose of a Community Council is be to ascertain, co-ordinate and express to the local authorities for its area, and to public authorities, the views of the community which it represents, in relation to matters for which those authorities are responsible, and to take such action in the interests of that community as appears to it to be expedient and practicable. The Community Council has a right to be consulted on planning applications and liquor licence application.